The picture shown above is the original top of an Open PCR machine. This part consists of a LCD screen and a heating lid. The top of the machine has several issues. For example, the lid is hard to open before the redesign. To solve these issues, we came up with several possible changes. 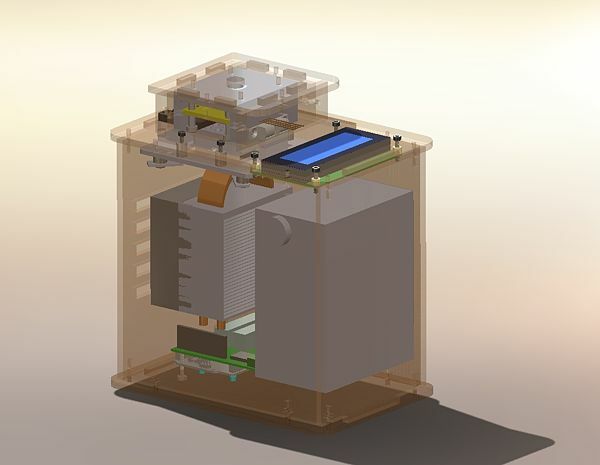 This picture show the redesigned Open PCR Machine complete with the modifications detailed below. Our group focuses on the stability of the machine. First of all, many groups have reported that the lid was hard to open. 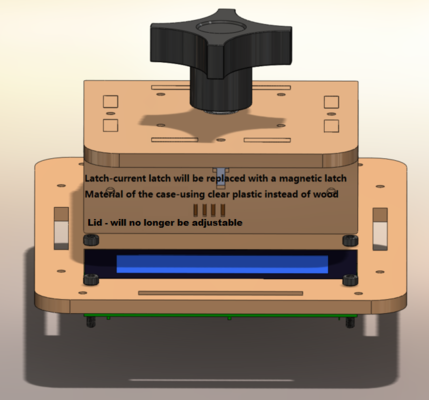 Since the problem is mainly caused by the current latch, the latch will be changed to a magnetic latch, which can be readily opened. Secondly, the machine is extremely fragile and the wooden outside does not provide much durability. In order to solve this problem, we can use transparent plastic instead of wood to make the case. Through this change, we can not only increase durability but also see the inner design of the machine easily. Last but not least, we can remove the knob which adjusts the heating lid height. This knob ultimately makes the machine more confusing, as it is difficult to tell whether the lid is too high - causing the samples to receive less heat - too low - squishing the samples and potentially warping or damaging the test tubes the samples are in - or at the proper height. Instead, the lid will remain at the same height as long as the machine is closed and a specific test tube size will be standardized for the machine. Where the original instructions explained the assembly of the latch on the lid, the original latch pieces will be replaced with the magnetic latch pieces. These parts will be installed in the same position and manner as the former latch, but will be two magnetic pieces rather than a latch that hooks together. Assemble inner parts and attach within case as explained in original instructions. Snap removable panel into place on the front (open) side of the case. Use provided screws to attach the lid hinge to the lid. Screw lid hinge into the top of the main case; lid should cover the sample plate. The original instructions on attaching the lid-adjusting knob will be removed. In their place will be a disclaimer providing information on the appropriate test tube size for the machine and where these test tubes are available for purchase. On your computer, download the Open PCR software. Place the PCR machine on a sturdy desk where it is unlikely to be disturbed, and turn on the machine. After turning on the Open PCR machine, plug it into an electrical outlet by using the power adapter provided in the kit. Connect the Open PCR machine to your computer by using the USB 2.0 cable. Click on the plus symbol next to initial step, and type 95°C for temperature and 180 seconds for time. In the third section, type in 30 for the number of cycles. Set the denaturing temperature to 95°C and time to 30 seconds. Set the annealing temperature to 57°C and time to 30 seconds. Set the extending temperature to 72°C and time to 30 seconds. Add a final step. Set the temperature to 72°C and the time to 180 seconds. Set the final hold to 4°C. Use one pipette to transfer one of the extracted DNA samples into one of the PCR test tubes. Next, add the forward and reverse primers to the test tube, using different pipettes for each. Then, use another pipette to transfer GoTaq master mix into the DNA/primer mixture. Dilute the contents of the test tube by filling its remainder with deionized water. barely touches the tops of the tubes. Click on “Plug in Open PCR to start” to begin amplifying DNA samples. Carefully observe the display screen on the lid of the Open PCR with the quantities that appear on the computer. If these quantities are close, then continue running the program. If these quantities are not close, then discontinue the program and try again. Run the program for two hours to allow the PCR machine to amplify DNA 30 times. Ensure that all of the components are functioning properly. Open the lid of the PCR machine, and remove the 8 samples from the PCR tray. With the fine point Sharpie, label the transfer pipettes and Eppendorf tubes accordingly to prevent contamination. Measure 400mL of Tris buffer into a 500mL graduated cylinder and pour into each of the Eppendorf tubes. Extract each sample with one pipette into an Eppendorf tube that contains 400mL of Tris buffer. Be sure to transfer all of the sample into the tube. Label the Eppendorf tube with the sample number. Set up the sample DNA calf thymus by pipetting 100μL into an Eppendorf tube containing 400mL of Tris buffer. Pipette 100μL of distilled water into the corresponding Eppendorf tube containing 400mL of Tris buffer. Place a glass slide onto the fluorimeter. fluorimeter lies in the center of the box. Turn on the fluorimeter so that a blue light shines. a glass slide. The two drops should combine to form a single larger drop. Adjust the slide so that the blue light shines through the drops. Dull the lights in the room, letting in as little light as possible into the box containing the fluorimeter. Increase the ISO to 800 or higher. Set the white balance to auto. Take an image of the fluorimeter and the drop, and record the image number and DNA sample. If desired, take another photograph of the drop. Repeat steps 7,10, and 13 for the 9 remaining DNA solutions using a different glass slide for each sample. Once you have taken all of the pictures, download them onto the computer. Right click on the file name of the picture and open with Image J. In Image J, select Analyze > Set Measurements and choose area, integrated density, and mean grey value. Select Image > Color > Split Channels. Three images will appear; choose the one named green. Select the oval tool and draw an oval around the drop. Then, go to analyze and measure, and record the measurements. Obtain the background reading by moving the oval over the dark area around the drop, and record the INTDEN and RAWINTDEN. Repeat steps 16-20 for all of the pictures. Make sure each sample lines up with the correct INTDEN measurements. Subtract the INTDEN background measurement from the INTDEN drop measurement. Set the DNA concentration in water to 0μg/mL and the DNA concentration in the calf thymus sample to 2μg/mL. Use a graphing program to generate a plot of INTDEN (with background subtracted) versus concentration. Select the option to display the linear equation. Use the linear equation and the INTDEN values of the samples to determine their concentrations. Once the DNA concentrations of the positive and negative are known, you can determine whether samples give a positive or negative result for heterotaxy. Heterotaxy, (Hetero-different) (taxy-arrangement), syndrome is the most common birth defect that primary occurs in the heart. This syndrome is caused by the mutated gene, ZIC3. The reference number for this syndrome is rs104894962. This disease can also occur in other organs but it is less likely. With this syndrome, organs that are paired together have a mirror image of each other instead of having their own charcterstics. Other organs can also be arranged in a different order requiring major surgeries to aline the organs correctly. In some cases, organs or body parts may work incorrectly causing irregularity, worse infections, more recovery time, or lack of functioning correctly. This is not the only kind of the heteotaxy however. As previously stated, the more common defects are located in the heart. Since most of the defects occur at birth, there is a varying type and severity. When the syndrome involves the heart, it is mainly because the heart sits to the right side of the chest instead of the left side. The sequence for the heterotaxy disease allele is CCTACACGCACCCGAGCTCCCTGCGC [A/G] AACACATGAAGGTAATTACCCCTTT, with the mutation occurring at the [A/G] site. When the A gene is expressed, the mutation occurs and heterotaxy is coded. When the G gene is expressed, there is no mutation and the gene expression is normal. 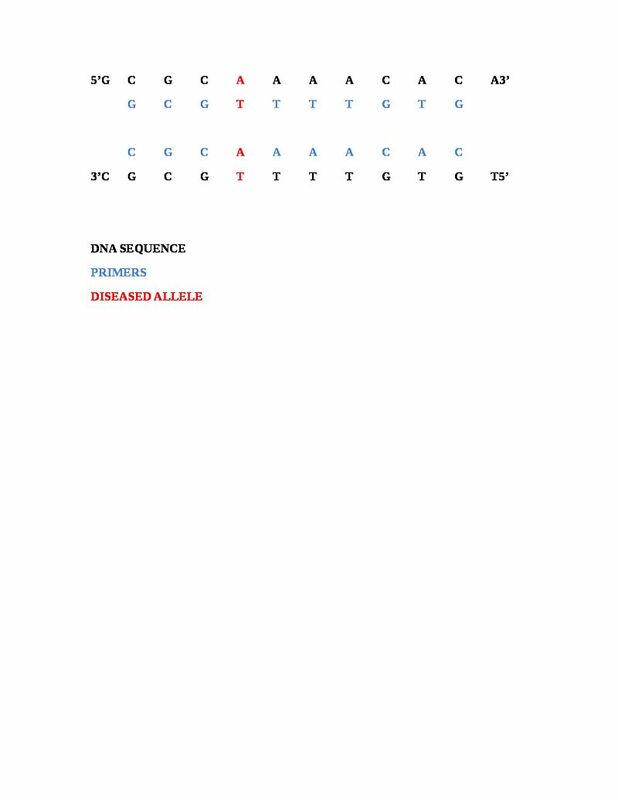 A heterotaxy disease allele will show a PCR product because the disease allele will be amplified many times through the course of the chain reaction. Because a non-disease allele will not have a mutated expression of the A gene, it will not yield a PCR product and will instead amplify the healthy allele expression. This page was last edited on 29 November 2012, at 18:34.